LEXINGTON, Ky. (April 5, 2019) ­– Nationwide, e-cigarette use in high school students has risen more than 75% and more than 50% in middle school students between 2017 and 2018. Rates of e-cigarette usage in Kentucky have risen at a similar rate, prompting University of Kentucky researchers and student ambassadors from Tobacco-free Take Action! (TFTA) to reach out to area schools to help build awareness. "We are learning that schools have no idea what to do when they are faced with students using these products to the extent that they are," said Melinda Ickes, Ph.D., program coordinator and associate professor in the UK College of Education. "The response has been amazing and we look forward to continuing these efforts next year, and going beyond doing one lesson in schools. We know that to truly evoke change, we need consistent messaging, multiple opportunities to educate and have discussions with students, and we need to support effective tobacco control efforts that can help change this trend statewide such as 100% comprehensive tobacco-free schools, increasing taxes on all tobacco products, and statewide smoke-free policies that change the cultural norm." The program began in Lexington's Dunbar High School and has since expanded to schools in Corbin as well as Woodford, Casey, Jessamine and Jefferson counties, with other counties requesting the program. 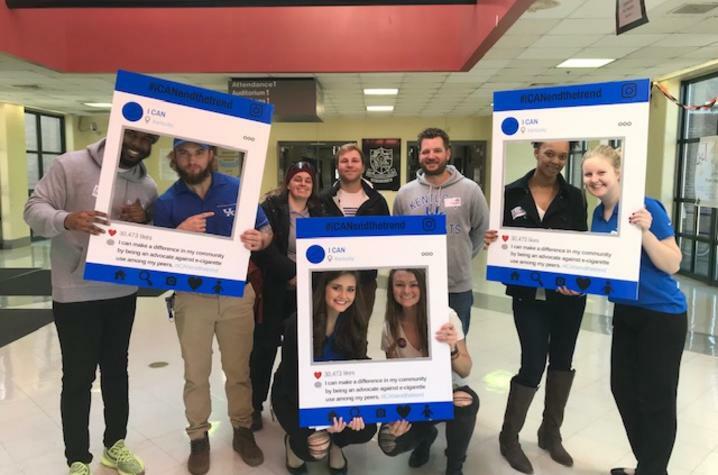 Thanks to the support of the Kentucky Department of Public Health, since its inception, the ambassadors have reached more than 2,000 students. Using a "peer-to-peer" model in which middle and high school students are connected with facilitators closer to their age, #iCANendthetrend was developed to help build awareness on the dangers of e-cigarette use and the cost associated with addiction, as well as building skills related to refusal techniques and identifying ways youth are being targeted by the tobacco industry. In addition, the goal is to empower younger generations to end the trend of e-cigarette use among their peers as health advocates. Peer models have been found effective when talking about general tobacco use and prevention as well as other health behaviors. The TFTA ambassadors worked collaboratively with Ickes and Elizabeth Whitney, Ph.D., both faculty in the Department of Kinesiology and Health Promotion (KHP) to develop the program's curriculum, which aligns with the National Health Education Standards. The ambassadors in turn trained undergraduate students enrolled in KHP 330, a program planning course for health promotion students, to expand the reach of the program and give these future professionals the opportunity for hands-on experience interacting with youth and delivering evidence-informed curriculum. For the TFTA ambassadors, this is more than a public health issue, it's a personal one. "The opportunity to present information on the dangers of e-cigarette use throughout the state of Kentucky has been the highlight of my experience as a TFTA Ambassador," said junior Hayley Leach. "As an older sister to someone who is currently a senior in high school, I have heard first-hand the problems of e-cigarette use in Kentucky schools. I feel fortunate to have the opportunity to combat this epidemic and teach students about the dangers associated and the long term health effects of addiction."